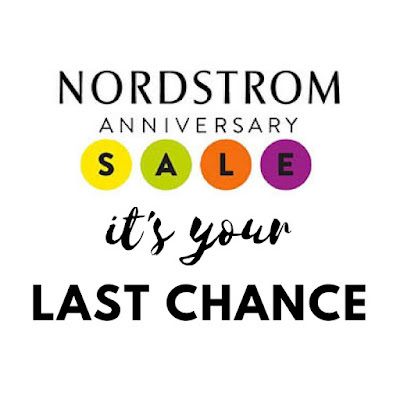 It's the finally week to shop the ever so popular Nordstrom Anniversary Sale. This year I opted to not go so crazy with the sale. I ended up purchasing a few of the items during early access from my original post I shared with you all. There was a delay in my shipping so everything ended coming while I was away on vacation and that set me back from not being able to show you my finds. A few things were already sold out and some of the stuff I ended up not loving as much as I thought I would, those items will be going back tomorrow. I decided to do all of my returns in store tomorrow this way I can try the rest of my wish list on and share with you all. I ended up updating some items to my list. With my second purchases, I also decided to go with bigger purchases such as jackets, shoes and accessories, as opposed to clothing. I really wanted to make sure I was getting the best deals instead of saving a few bucks on a sweater that I can buy later down the road. Here are my updated finds and if there is anything you want me to try on for you while I am at Nordstrom tomorrow, please shoot me a DM on Instagram or send me an email! Click on each images to shop that exact Item. I knew I wanted to add a purchase a few jackets from the sale because I always add them in the fall and they tend to be a little pricey. One of my favorite Items from the sale which I missed the first time around is this Army style jacket pictured first. It's under $100 and such a big trend for the fall. Next up this brown leather Jacket, I think it's a classic leather jacket, the color is gorgeous and it's price at $89, making it another favorite of mine. I don't think a girl can have too many denim jackets or at least I can't . This denim jacket is so fun with the embroidery, I could totally see myself rocking it with a white slip dress and some booties in the fall. I'd add this denim jacket to by wardrobe because it's priced at $50! I love be a good parka, I'm not too sure if I will purchase this one until I hit the store but this pink faux fur hood has got me loving it online! If it's as good as it looks for a price tag of $80, it may have to come home with me! The faux fur color block jacket has been on my radar since the sale started, it was one of those pieces I couldn't stop thinking about. I was hoping it wouldn't sell out and as of right now I'm in luck! It's so cute and I would totally rock it all fall long, I'm hoping it will look good on me tomorrow! (fingers crossed) Next up is this super fun faux leather and faux fur trim jacket. This is the kind of piece I love added to my looks in the fall. I'd pair my distressed boyfriend jeans, black leather booties and a white tee and be good to go! It's also marked at $89 which is such a good price for this jacket! Last up is the ever so popular Blank NYC suede jacket. I ended up purchasing two Blank NYC jackets, the black leather (here) and also the metallic leather (here) I decided to return the metallic and I don't think I will wear it as much as I thought that I would. So since the metallic is going back I think this suede will be a good replacement! I knew I needed to purchase some shoes from the sale because the prices are so good. The first time around I only got the BP. Slides (here) which are sold out. So I thought I should go back and take advantage of the good deals. I love the twisted mules which would go with just about ever look in my wardrobe, they are so me! The studded sandals are so fun and would go great with my Blank NYC jacket they are priced under $100!! I can't believe I missed the velvet platform sneakers by Rebecca Minkoff they are something I would rock all fall long with my casual day to day looks. Also they are under $90 dollars which is a steal for Rebecca Minkoff!! Last up these block heel booties you guys, I LOVE THESE and I think I actually want them in both the black and the grey. I think they will be really flattering on, they are priced at $86! Last up, I found some really good sunglasses for you all. I bought one pair and won't be buying anymore, but I wanted to share my favorites with you. So the first ones are the Le Specs which I did end up purchasing and I LOVE THEM! They are mirrored and gold, and are priced under $60. Next up are the black and grey speckled oversized Quays which I think are so cute and are only $35. Last up, this is a pair I really love and wish I had seen them sooner. They are Kate Spade gradient lens and oversized . I love the shape of them and the color. They are priced at $120 which is so good for these!